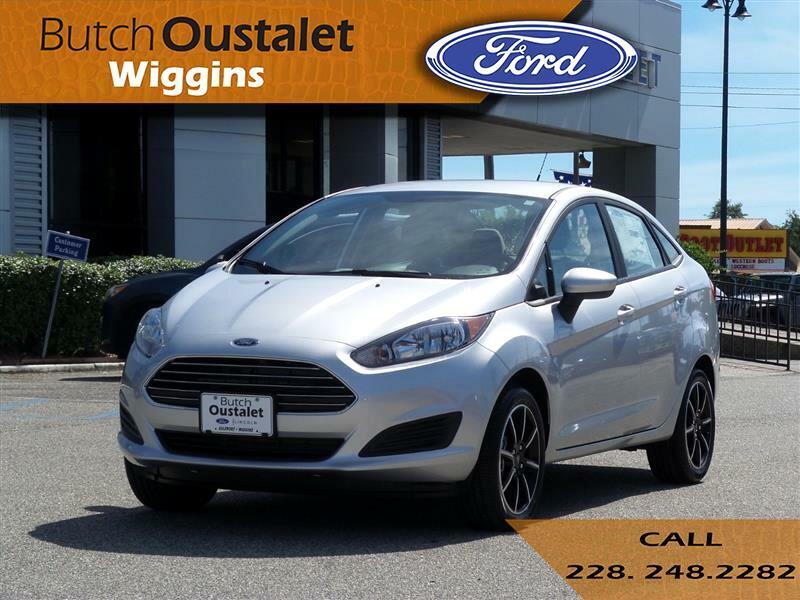 New 2019 Ford Fiesta SE for Sale in Wiggins MS 39577 Butch Oustalet INC.
Stay nimble with the 2019 Ford Fiesta. It’s the small car that’s big on value, with a choice of two body styles – sedan and hatch – to match your lifestyle needs. The sedan has a trunk with 12.8 cu. ft. of capacity and 60/40 split seats that can be folded to accommodate long items. The versatile hatch model with its wider opening handles large cargo, with its 14.9 cu. ft. of rear space and 60/40 split rear seat backs, increasing space to 25.4 cu. ft. when lowered. It’s what’s on the inside that counts, with an intuitive center console and available ambient lighting to match your mood. Along with super stylish wheel deisgns, the Fiesta offers two engines to suit your style of driving: the responsive 1.6L Ti-VCT I-4 and the high-output turbocharged and direct-injected 1.6L Ti-VCT EcoBoost I-4. With Eruo-inspired suspension, electric power-assisted steering and electronic stability control, plus manual or automatic transmission, there’s no stopping this feisty car’s power. The Fiesta is filled with savvy tech, including SYNC 3, Apple CarPlay and Android Auto compatibility, available navigation system, premium audio system, FordPass app access, smartpcharging USB and a rear-view camera. Program #20978: Not all buyers will qualify. Ford Credit limited-term APR financing. Take new retail delivery from dealer stock by 04/01/2019. Not all Fiesta models may qualify. See dealer for qualifications and complete details. Truth in Lending Act Disclosure: Down payment will vary with APR and credit. For example, 0.0% APR with $2,500 down payment provides for 60 monthly payments of $16.67 per $1000 financed for qualified buyers. 0.0% APR for a term of 36 months corresponds to a monthly cost of $27.78 per $1000 financed. 0.0% APR for a term of 48 months corresponds to a monthly cost of $20.83 per $1000 financed. 1.9% APR for a term of 72 months corresponds to a monthly cost of $14.71 per $1000 financed. 2.9% APR for a term of 75 months corresponds to a monthly cost of $14.59 per $1000 financed. The rates described are for estimation purposes only; you may not be able to finance at this rate. Message: Thought you might be interested in this 2019 Ford Fiesta.